This one-day tournament format is gaining popularity from its place of origin, the Cavendish North Backgammon Club in Southfield, Michigan. 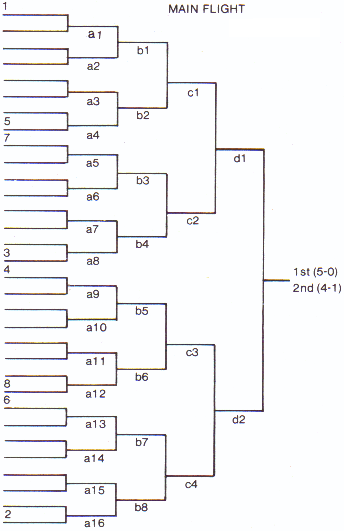 The tournament can accommodate thirty-two players with five rounds of eleven-point matches. Eight to ten hours is needed for completion of this double-elimination contest. Here's how the system works. The auction is held first; the players who receive the highest eight bids are seeded in the main flight (1 through 8 as shown). 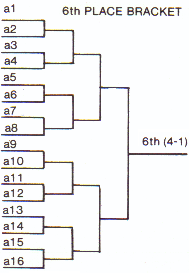 The byes, if any, are awarded to the seeded players, the rest being randomly seated. Once the main flight has been made up, play begins. All first-round losers are grouped into a sixteen-player bracket and the winner, with a 4–1 record, is awarded sixth place. 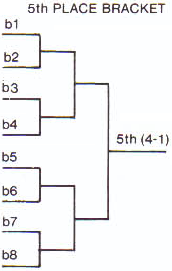 All second round losers are grouped into an eight-player bracket and the winner (4–1) is awarded fifth place. This works the same for awarding fourth and third places. The two players with 4–0 records play for first and second places. All money matches should finish at approximately the same time. The Michigan Movement is a happy medium between a local and a regional tournament. It has the regional tournament flavor due to the eleven-point matches, without the additional expenses such as travel and hotel. Local players trying to gain experience benefit from this format. It has been said that a well-organized tournament runs itself and the Michigan Movement is easy to organize. The clubs which have tried the Michigan Movement usually add it as a regular club activity.